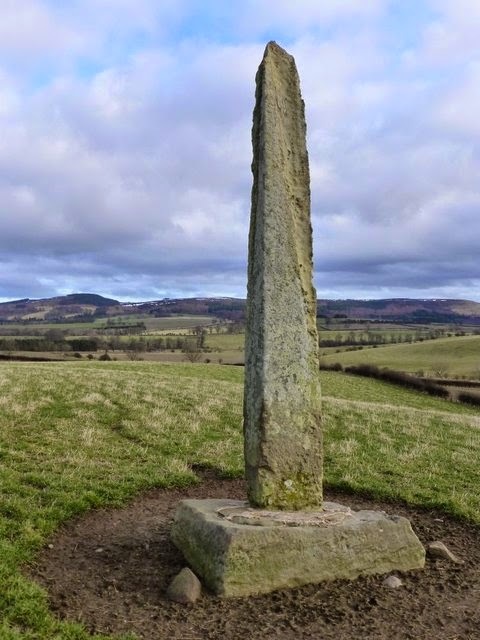 In the middle of a farmer’s field a couple of miles to the SW of Chillingham stands the Hurl Stone, a ten-foot high rough-hewn obelisk of unknown origin yet steeped in myth and legend. Hard facts are difficult to come by, but who needs ‘em? First of all there is its name. 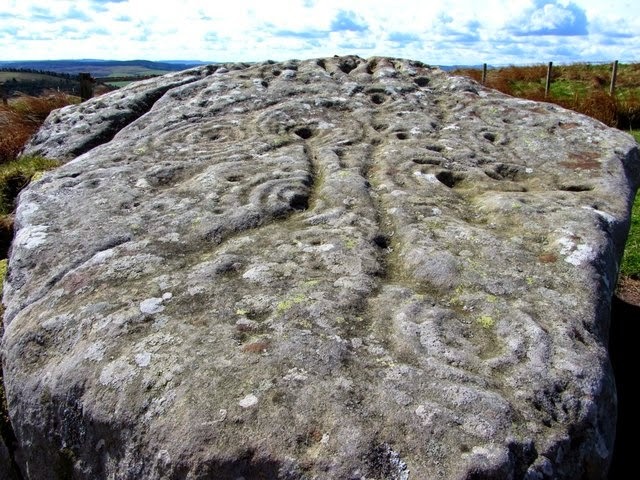 Some speculate that it is derived from the ‘Earl’s Stone’ – though the identity of the gentleman in question is not known. It may have been an ancient standing stone (or cross) at one point, possibly relocated to its present spot by someone or other. 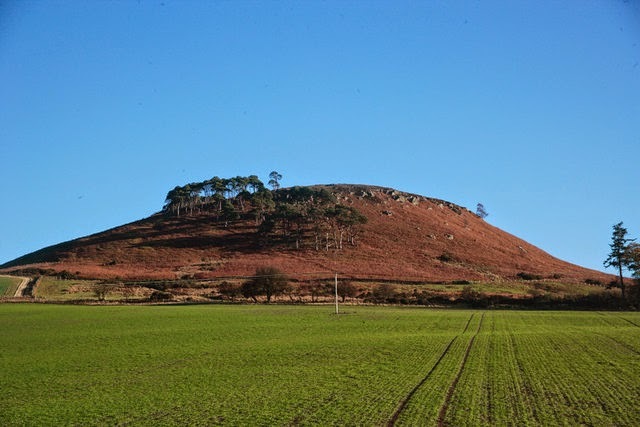 Everyone’s favourite theory, though, is that it was literally ‘hurled’ there by the Devil himself, who, when perched high upon the Cheviot, saw pesky St.Cuthbert going about his pious wanderings in the distance and threw the stone at him in anger. The Hurl Stone is supposed to be the haunt of fairies, too. An underground passage some sixteen miles in length is supposed to pass under the stone (linking Cateran Hole in the east to Henhole in the west), which, when it was once explored in times of old, revealed evidence of underground fairy-like activity immediately beneath the stone. The adventurers didn’t hang around long enough to investigate further and scarpered sharp-ish. Sorry to disappoint, but chances are that the Hurl Stone was once a medieval Christian cross which lost its top and was then recycled as a folly (of sorts) by someone with nothing better to do. Some attribute the act to a Mr Jobson, a local farmer, and that a bolt of lightning accounted for the missing couple of foot or so. When its development was somewhere in between, one Henry Ogle lived there for a time prior to his death in c.1669. He was a staunch Parliamentarian, and was at his most boisterous – nay, cocky – during the days of Cromwell. Around 1649-50 he was involved in two instances for which we have precious little information, but which nevertheless provide a neat little window into what was, at the time, a pretty crazy world. 1649 – The Magistrates of Newcastle sent to Scotland for a man who pretended to discover who were witches: on his arrival the bellman went through the town, crying “all persons who would bring in any complaint against any woman for a witch, they should be sent for and tried by the person appointed.” Thirty women were brought into the town-hall, stripped there, and had pins thrust into their bodies, and most of them condemned for witches! 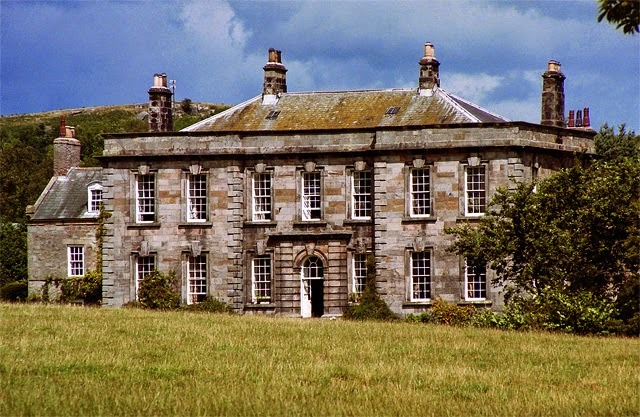 The witch-finder went from Newcastle to Northumberland, when [magistrate] Henry Ogle, Esq. laid hold of him and required bond to answer at the sessions, he escaped into Scotland, where he was apprehended, cast into prison, and condemned; when on the scaffold he confessed that he had been the death of 220 women in England and Scotland, for the gain of 20 shillings each! No one knows for sure who this notorious witch-finder was, but it may have been the infamous John Kincaid (however, Kincaid was not collared and executed until 1662, so there may be some confusion here). 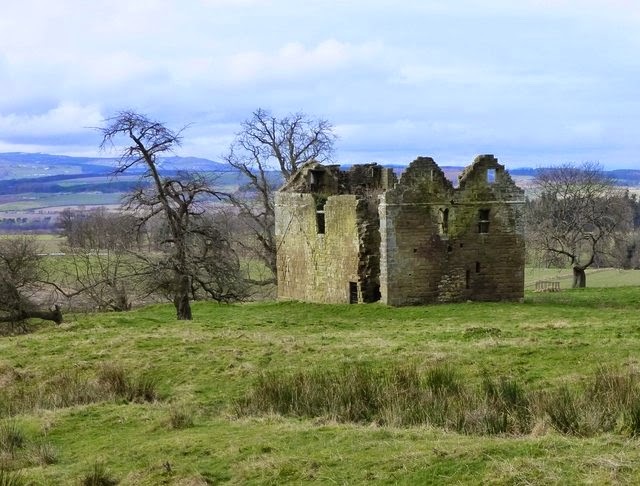 Henry Ogle of Eglingham Hall may have played a prominent role in the casting out from the region of the pesky witch-hunters, but a year later he had a run-in with his ‘hero’ Oliver Cromwell, who, on the way to the Battle of Dunbar in 1650, stayed over at Henry’s house. Legend has it that the next morning the two of them quarrelled (over exactly what we don’t know), and that they may even have duelled over the disagreement. I should think that their differences were soon patched up, though, as Henry was elected MP for the county in 1653 and 1654. But the story of the little dispute lived on, and inspired the poem Cromwell’s Visit: An Eglingham Legend by James Hall … and if anyone out there has the text of the said ditty I’d like to hear from them! Canon Henry Baker Tristram was an English clergyman, naturalist, Biblical scholar and traveller. Somewhat controversially for his time, he was an early convert to Darwinism, and spent many years attempting to reconcile the theory with his religious beliefs. 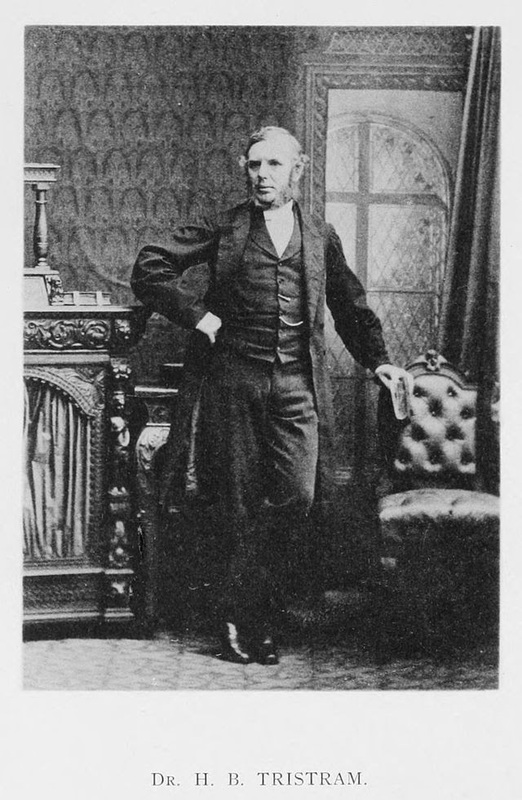 Tristram was born at Eglingham vicarage in 1822 – the eldest son of the vicar – and studied at Oxford. He was ordained a priest in 1846, but his fragile health (TB included) forced him to live abroad. He travelled widely, including a stint as secretary to the governor of Bermuda from 1847 to 1849, where an interest in birds blossomed – but on returning to UK shores found the winters too much for him. Several expeditions to Algeria followed, including exploration of the Saraha desert and yet more ornithological adventures – and wrote a book entitled The Great Sahara. He first visited Palestine in 1858, returning there several times, where he expanded his collection of birds and identified possible Bible sites. Amidst all of this he became canon of Durham Cathedral in 1873, though his travels continued, including the Middle East and also Japan where his daughter spent decades working as a leading light at the Church Missionary Society’s School for Girls. His infamous link with Darwinism began in the late 1850s when he was seduced by the writings of the great evolutionist. Looking at his own collections of birds, he became convinced of the validity of the new-fangled theory, and penned articles in support of the same. Tristram, who was a Fellow of the Royal Society, wrote books, papers and articles of all his various adventures, concerned mainly with naturalism and the topography of the Bible lands. His sizeable collections of birds and eggs ended up in Liverpool’s World Museum and the Natural History Museum, London. And as any ornithologist will know, a number of birds are now named after him … as well as a breed of gerbil! He died in 1906 and has a window dedicated to his memory in the north aisle of Eglingham Church.